Distribution & Habitat: Gerbera jamesonii is found naturally in grassland in sandy, well-drained soils in Mpumalanga, Southern Africa. This plant produces tall colorful flowers in season. Most of the Gerbera jamesonii today are hybrids and come in a wide array of floral colors. Gerbera jamesonii species is a tender perennial grown in gardens throughout the world often as an annual plant. In the greenhouse, they will bloom all year long. In hardness zone 7, used in the landscape, they will bloom from mid-April to October. The 7-10cm (3-4 inch) flowers are on a single stem per flower. Description: Gerbera jamesonii is a perennial herb with deeply lobed leaves covered with silky hairs arising from a crown. Leaves occur in basal rosettes, petioled, oblong-spatulate and deeply lobed to 25 cm (10 inch) long by half as wide. Plants can reach up to 45 cm (18 inch) in height with a spread of 60cm (24 inch) wide. The striking inflorescence is borne on a long stalk and the outermost petals (ray florets) may be cream, red, orange or pink, while the central flowers (disc florets) are cream or dark colours. Flowering occurs in spring and autumn. Houseplant care: Deadheading (pinching off spent blooms) will encourage a longer blooming season. Removing old leaves promptly helps prevent fungus from growing on the plant. Light: Gerbera jamesonii require full sun or a sunny position. Put the plant on a bright windowsill, where it will get some direct sunlight. Gerbera jamesonii appreciates some afternoon shade in hot summer climates. Growing Gerbera jamesonii on patio is another option, as long as the temperature doesn’t rise above 24°C ( 75°F). Watering: Gerbera jamesonii need moderate watering. Rot will occur if the crowns are buried or the drainage is poor. The soil the Gerbera jamesonii are planted in should always be moist, but never wet. If the water is not draining well, repot with better soil or a better draining pot. Water the potted plant until you see water coming out the drainage hole and discard any water left in the saucer. Don’t water again until the top 2-3cm (1 inch) of soil is dry. Average room humidity is good for Gerbera jamesonii grown in pots. 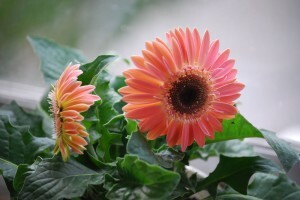 Temperature: Gerbera jamesonii needs cool to average temperature 13-24°C (55-75°F). Bring Gerbera jamesonii indoors when the weather begins to cool in the fall, and they will live for several years, even blooming in the winter. Fertilising: Plants do best with frequent feeding, especially in summer, to promote flowering. Potted Gerbera jamesonii should be fertilised every two weeks with a weak liquid fertilizer, in summer when the plant blooms. Soil: Gerbera jamesonii will grow well in a soil mix consisting of 2 parts peat moss to 2 parts sand to 1 part loam. Potting and repotting: Gerbera jamesonii appreciate a pot you might think is slightly too small. They like their roots bound and not able to spread out. Pot the Gerbera jamesonii in a good quality potting soil. Gently turn the plant upside down in its current pot. If the plant does not easily release from its container, a gentle tap or two should make it come free. With your hands, slightly loosen the soil around the plant, being careful not to disturb the plant root system too much. Fill the new pot with some potting soil, add the plant, and fill in with more potting soil. To prevent rot, the crown of the plant should be above the soil level. Water the newly potted plant, and allow to sit in a shady area for a few days, then slowly acclimate the Gerbera jamesonii to full sun again. Culture: Grow in average to organically rich, medium moisture, well-drained soils in full sun. Raised beds should be considered in areas with poorly-drained soils. Performs best in climates with warm summer days and cool nights. Grow as annuals, either in the ground or in containers. During the growing and blooming seasons, the plants are watered and allowed to dry slightly. Too much water can cause crown rot. Plants are fertilized monthly with a balanced fertilizer, especially during blooming. Spent flowers should be trimmed off. Plants develop deep root systems, resent disturbance and can be difficult to pot up in fall for overwintering. If overwintering is desired, consider sinking pots in the garden to the rim so that pots may be taken indoors in fall. Store potted plants/containers in a cool location frost-free location with bright light but only enough moisture to prevent the soil from totally drying out. In the greenhouse, during the winter months, flowering slows, the plants are allowed to dry a little more, and fertilizer is reduced to one a month. This is a very important time to pay attention to your watering practices. Propagation: Gerbera jamesonii can be grown from seed or crown divisions. Seeds should be germinated within 1 to 2months of collection, at about 20 to 25oC, and will flower after a year. Start seeds indoors in early spring (6-8 weeks before last frost date). Set plants out in middle spring (after last frost date). Basal offsets may be taken from favorite plants in late summer for rooting and subsequent overwintering in pots. Use: Gerbera jamesonii is one of the most popular ornamental flowers in the world, both as a cut flower and as a pot plant. In gardens the Gerbera jamesonii is used in beds, borders or edging. As a cut flower, Gerbera jamesonii have a vase life of approximately 14 days. As a pot plant, Gerbera jamesonii is considered one of the most useful plants for improving indoor air quality to living and working spaces. Dwarf varieties of Gerbera jamesonii looks great on table tops in well lit areas. NASA says this plant is fantastic at removing benzene, a known cancer-causing chemical. It also absorbs carbon dioxide and gives off oxygen overnight, which is said to improve your sleep! Problems: No serious insect or disease problems. Overly moist soils can lead to root and stem rot. Also watch for gray mold, powdery mildew and anthracnose. Thrips, leaf miners, spider mites, aphids and whiteflies are occasional insect visitors. Slugs and snails are partial to the leaves, and Gerbera are prone to some viral, bacterial and fungal diseases. With Gerbera jamesonii care should be taken not to allow any dry pockets around the roots, which can cause the plant to wilt. Leaf spot (fungus problem) will show up on the leaves as brown spots surrounded by light-colored borders. Treatment & Prevention: Allowing good air circulation around the plant will help to prevent leaf spot. Isolate the plant and cut off any affected leaves. Treat with a fungicide made for leaf spot, if necessary.